Although I created Notinhalloffame.com initially based on those who are not in the Rock and Roll Hall of Fame it surprises people to learn that I am not really that passionate over who has been omitted. Sure I think that it was a travesty that it took Rush over fifteen years to get inducted but it never kept me up at night or necessitated to me write a blog about it. Still, when anyone does ask me who if I could right one wrong of the Rock Hall, it would be Kraftwerk, the German synth-pop band that when any musical artist utilizes anything electronic in their sound needs to tip their cap in homage to them. It wasn’t just Kraftwerk, as 1970’s Krautrock would play a part in influencing the American scene, as would later German heavy metal. The Beatles formative years took place in Germany and David Bowie would be influenced there with his “Berlin Trilogy” of albums in the mid-70’s. Basically I am telling you that the German contribution to American music is a hell of a lot more than embracing the music of David Hasselhoff and 99 Luftballons. Connie Francis and other artists were showing that music with a European flavor (specifically Italian and German) were marketable and while with the exception of Horst Buchholz, “the German James Dean” who had a horrific acting performance in the 1960 Western, The Magnificent Seven and generally stunk up anything he was in. Still, at the very least he wasn’t playing “Evil Nazi soldier #5” so that beat every other German actor this side of Hogan’s Heroes. Essentially, the climate was such that a man with the name of Bert Kaempfert could have a hit in the United States. 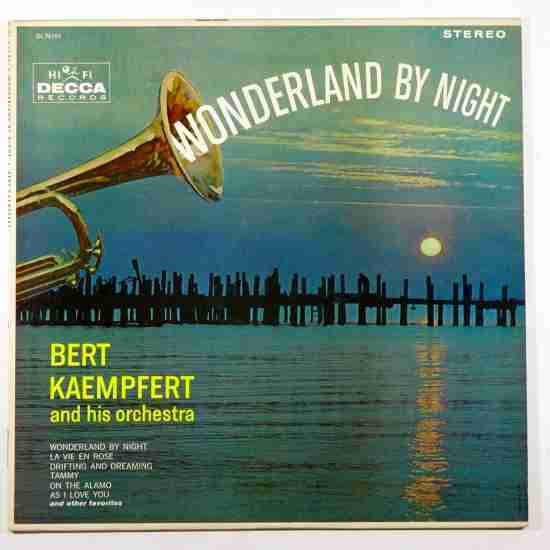 From Hamburg, Germany, Bert Kaempfert was inspired by the 1940’s big band sound and set out to make one of his own. He would set out to not just understand composing and arranging, he mastered as many instruments as he could and by the late 1950’s he was a known commodity in Germany, which his orchestra generating hits in his native land, though ironically his largest hit was ignored by his local label. Decca Records in New York City snapped up “Wonderland by Night” and it fit the easy listening pattern that Percy Faith made a mint on the year before. Like Faith’s “A Theme From A Summer Place”, Kampfert’s number one was rich and textures, and while it had a soft sound it was far from shallow. This would be Bert Kampfert’s largest hit by far, but not his only one as he would reach the Top 40 three times and the Adult Contemporary Top 40 seventeen times, however back in Germany he made a very significant contribution in pop culture when as a producer he signed a Liverpool singer who was performing in Hamburg, Tony Sheridan and he needed to recruit a band to back him up. That band would be the Beatles, who were based there at the time, which essentially gave them their first real break. Wait a minute? Does that mean that the Germans were really responsible for the British Invasion? Other Notable Songs that charted but did not go to number one in this time period: January 9 9, 1961 – January 29, 1961. It did not however stop me from writing an extensive list of who should be in and setting it up for people to loudly complain as to why their favorite band/singer should be. What I remember the most about the video was that the singer, Nena, did not shave her armpits. EWWWW! For reasons that will never be clear to me, in my twenties I worked on a Horst Buchholz impression from the Magnificent Seven specifically the scene where he confronted Yul Brynner about “clapping his hands”. Amazingly, that did not help me with the women. With our father being German, my brother and I (though this affected him far more) were not permitted to watch “Hogan’s Heroes”. “No German is that stupid” he would always say.